Along with iPhone 7 comes iOS 10 — a brand-new look for your iPhone (or perhaps a brand-new brick for those of you who upgraded with your iPhone 5) — including Siri upgrades, the ability to finally delete the Stocks app and, most importantly, a whole bunch of new crap in your iMessages. Apple is betting big on iMessage. They know it’s oftentimes the thing that keeps people buying iPhones — so that they can send those perfect blue bubbles back and forth without interruption, so that they be involved in group texts, so that they can make jokes about read receipts, I guess. So to up the ante on their messaging game, Apple looked to Japan — and popular apps like Line and WeChat—for inspiration. Thus: stickers. That’s not to say these stickers haven’t been a long time coming. Our obsession with emoji led the way, spawning the Bitmoji craze (which I personally would love to leave in 2015), and subsequently Kim Kardashian’s Kimoji and celebrity-created Kimoji knockoffs like Justin Bieber’s Justmoji (which we can all agree is an awful name for Justin Bieber’s emoji). These custom-made, for-profit “emoji” used to live as third-party keyboards in our iPhones — meaning, we had to install them as apps, add them to our keyboard, and then, when we wanted to actually use them, switch from our normal keyboard into a different one. Not the most complicated thing, but not an ideal situation for a product that people were clearly willing to pay for and a business that Apple was eager to grow. That’s why iOS 10 comes complete with a whole lotta mess in your iMessage. An option to send your “heartbeat,” scribble on a photo or video and a whole new “app store” — but just for “iMessage apps,” including: stickers. What was once a text message is a garbage dump. Yes, of course it’s fun. No, in no way is this useful. In no way do the hideous new iMessage features (stickers, animations, big message bubbles) make the world a better place. 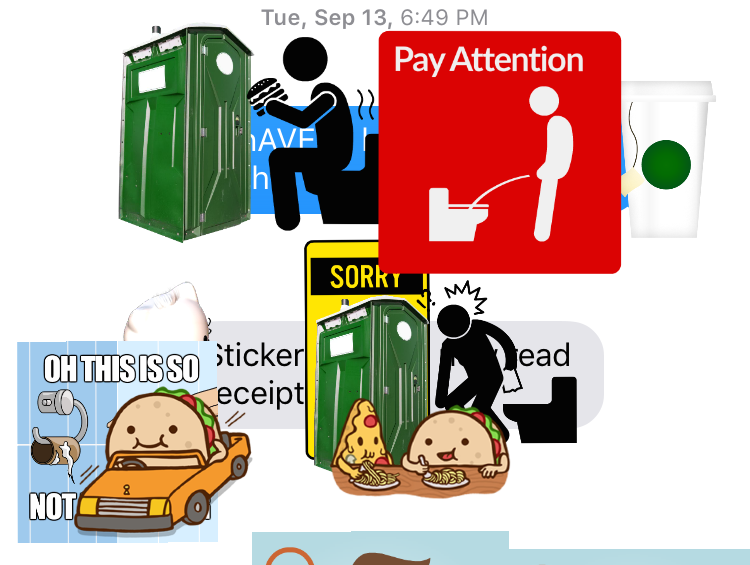 Is there an "accessibility" setting to neuter the STICKERS or will we be forced to turn off iMessage and have green bubbles like heathens? No matter. If it makes the App Store ecosystem (and Apple in general) more money, that’s what they’re gonna lean toward. The other thing that makes Apple more money is your having to purchase a new iPhone to use after their brand-new iOS makes your old one virtually useless in the New World of iOS 10. They will sticker your poor old phone into submission. If you decide ditch iMessage for the land of green bubbles, that’s on you. God knows we’ll never be able to text again.